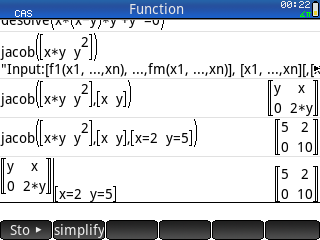 Description: CAS program that calculates the Jacobian of a matrix. Also can evaluate it at a certain point. Can you make a new function to evaluate jacobian in one point, for example: jacob( [x*y,y*y],[x,y],[x=2,y=5]) ?